S.A.C. 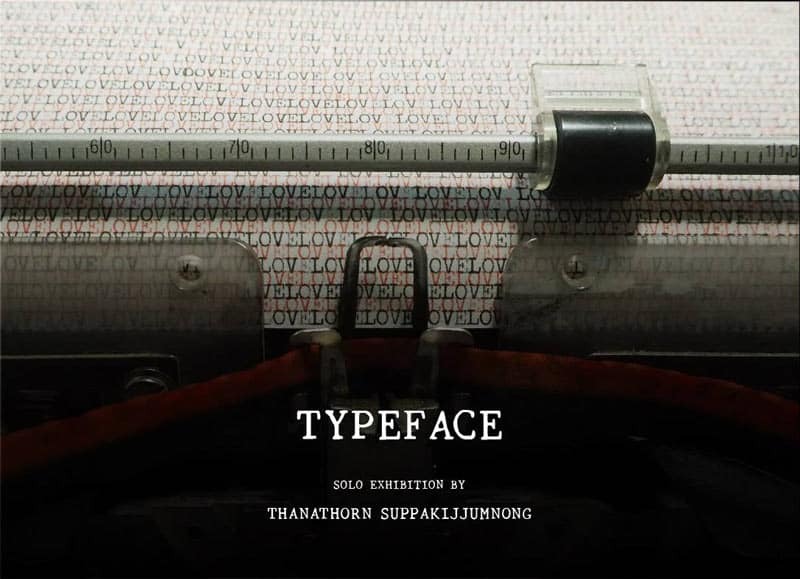 Subhashok The Arts Centre is proud to present Typeface, a solo exhibition by Thanathorn Suppakijjumnong in August 2018 showcasing her creative works of art. – The familiar sound returns…. Today, the sound of typewriting occurs again after disappearing for a long time since the typing school, the Suppakijjumnong family’s business, was shut down due to the dominance of computers. But this time, the role of the typewriter is different from the past; it is not used for creating any documents. Instead, Thanathorn Suppakijjumnong, the artist and a daughter of Suppakijjumnong family brings back the old typewriter to create works of art in a unique style. Every type tapped on a paper is not only writing words for linguistic meanings; but the words also represent the relationship, bond, and love in Suppakijjumnong family. Awagami paper, an excellent quality of paper imported from Japan, is the material that the artist selected to create works of art as the fiber of paper is cohesive and durable as well as being able to retain the color of papers. The process of producing artworks starts with typing words on the paper, then cut into square shapes and fold them into a symmetrical composition. Subsequently, the folded papers are arranged methodically to visualize her self-portrait in various ages. With diverse colors of ink ribbons, they lead to reflect on the chronicle of the artist’s life. Love is the word that covers the whole area of the artwork and some parts are pasted with small letters written the teaching words of her parents, the teaching words that warmly nurture kids until grown-up. Aside from the diverse tones of characters that the artist can control them skillfully, an open-closed cover of each letter is the artist’s intention to invite audiences to interact with the works. Thus, each teaching letter can cultivate in their minds and all together form a new experience of warm nurture. Typewriters with Thai keyboard was invented in 1892 by Mr.Edwin Hunter Macfarland, an American missionary and was given to King Rama V. The king was satisfied with the features after the first try and he became the first Thai-typewriter user. The typewriter is an important invention in the history of mankind that changed the way people communicate. The artworks by Suppakijjumnong revive the machine which is almost forgotten in the history back to life by employing it to depict her life’s stories in a contemporary way. Besides the unique technique, Suppakijjumnong’s artworks act as significant records inscribing the connecting and interweaving of diverse cultures. Thai alphabets express the strength of national culture whereas English is the international language which is important for communication all around the world. With her outstanding ability, the language barriers collapse; remains only the implication of the language, the visual aesthetics of works and the attractiveness of letters. All of the significance mentioned above result in her artworks have been collected among international collectors whom although cannot understand the meaning of Thai words, the warm nurture can be communicated through visual forms of letters. The typeface connects people with the sensation of happiness and valuable memory that the artist creates with great care. – You are cordially invited to join the opening reception on 16th August 2018, 6:00 PM at S.A.C. Subhashok The Arts Centre, Sukhumvit 39, Bangkok. Thanathorn Suppakijjumnong was born in 1992 in Khon Kaen province, Thailand. She graduated with a bachelor’s degree in Printmaking from Mahasarakham University and earned a Master of Fine Art in Printmaking from Faculty of Painting Sculpture and Graphic Arts, Silpakorn University. During her study in the master’s degree, Suppakijjumnong had developed a printmaking technique with typewriters, the tools that she was familiar because her family used to run a typing school. Suppakijjumnong employed teaching words taught in her family to be typewritten with diverse colors of ink ribbons to create a variety of tones and values on papers; following by cutting, folding, and arranging numerous tiny pieces to self-portrait and family images which resemble her family’s photographs. Her distinctive works have won many major awards in Thailand, such as “ Bring Good Thing to life” Toshiba Art Awards in 2015 and The White Elephant Art Award in 2016. After graduated the master’s degree, her works have been interested and invited to exhibit in several group shows in Thailand and international stages. Suppakijjumnong is regarded as a remarkable young Thai artist whose creative works attract numerous art collectors in many countries.